Boost productivity levels by automating and streamlining your workflow with this compact, flatbed scanner. Produce up to 40 images per minute with two-sided scanning and a 50-page automatic document feeder (ADF). Scan pages up to 8-1/2"" x 122"" through the ADF and use the flatbed for bulky media. Full-featured TWAIN driver lets you scan directly into applications without opening another program. Included Scan software allows you to quickly share or archive scans directly to popular cloud destinations. Plus, the scan software includes auto-imaging features to enhance images and delete blank pages. Accurately capture text from your documents for easy editing with Scan and I.R.I.S. Readiris Pro OCR software. Instant-on technology lets you begin scanning immediately without any warm-up. 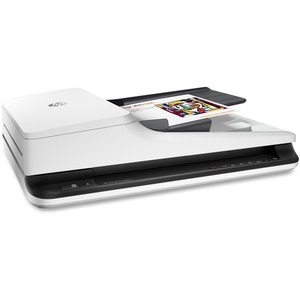 Flatbed scanner captures sharp, true-to-life scans of documents, graphics and photos with up to a 1200 dpi resolution. Scanner also features a 120 MHz processor speed, 64MB standard memory and more.